From the A465 “Heads of the Valleys” road take the A4046 to Ebbw Vale. Continue south on the A4046 driving just past the village of Cwm on your right hand side. 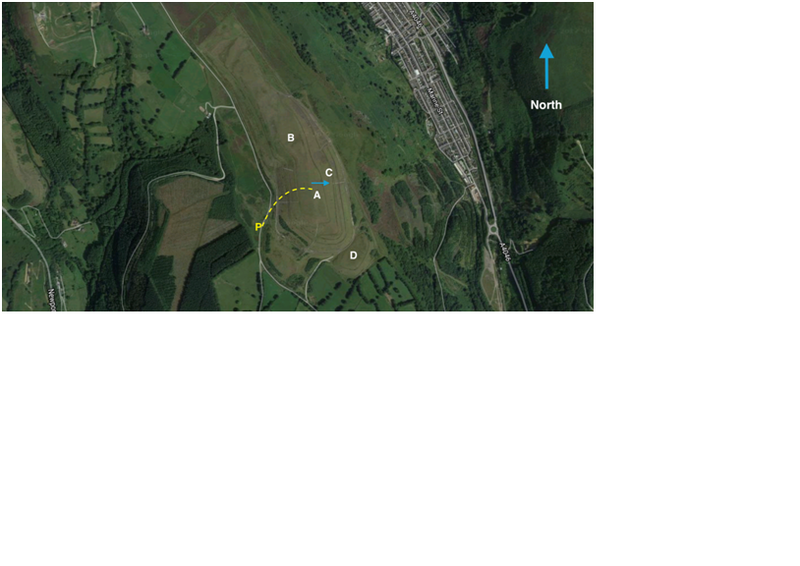 At the next round about take the 3rd exit and enter the south side of Cwm. Then take the first turning on the left up a steep hill, this is marked with a sign post showing cycle route 466. Follow the hill to the top and take a right turn onto Manmoel road at the T-junction. Continue on Manmoel road towards the hill. Eventually you will pass over a cattle grid, drive for another 100 metres and parking is along the side of the road. Park along the edge of the road. Do not drive onto the common. Access to take off is by foot only. Leave the road and follow the track north until you come to a gate in the fence, which is padlocked (no key available). Climb over the gate and walk straight up the hill for about 200 metres. The take-off area is large and flat with a nice rounded front to the hill. Take care not to stumble in the subsidence cracks near take off as these can be obscured by ground cover. There are also several ridges running parallel across the side of the hill that should be observed. The top landing area (A) is large, flat and free from any real obstructions although beware of the two water connection pipes that stick up in the air about 1 metre. There is also a large flat shoulder to the north of take-off (B). This can be turbulent if the wind is off to the south. There is no suitable bottom landing field. Paraglider pilots can slope land on the front of the hill but should be aware of the rough nature of the ground. There is a narrow flat ridge (C) to the front of take-off that has a barbed wire fence running across it and there is an even piece of ground (D) on the southern shoulder, south side of the take off. A nice site to fly which is under-used really considering the good road access and top landing area. Wave is not uncommon and good height gains are possible even in winter. Can be a good alternative to Pandy. Watch out for subsidence cracks near take off and ridges running parallel across the sides of the hill. Water pipes sticking up about 1 metre on the top of the hill. Beware of the wind turbines on the back of the hill, especially if going XC – there will be significant turbulence down wind of them. 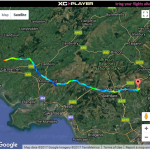 PG – Nick Roberts flew 82.8 km on his Advance Sigma 9 on 02 May 2017.